With Intempus Time Registration you can manage your business and get rid of all the paperwork. Intempus makes billing and payroll easy, fast and efficient. That means more time for the things that you care about. With Intempus you get the opportunity to report start- and finish time for your completed work. The App calculates the time and can even deduct breaks from the reported hours. In Intempus you can register all types of units, such as billable work, sick days, vacation, etc. Make your complex timesheet as simple as possible! Intempus’ mileage function allows the users to type in their start- and end location, and then Intempus will calculate the driven kilometers. With Intempus there is no need to look the route on krak anymore. Intempus can also handle multiple types of mileage such as “Mileage own car” or “Mileage company car”. Tired of the pile of receipts laying around? Let Intempus help you keep them in order. Report expenses through the app so all documentation is always accessible in the cloud. Daily food allowances can also be reported for reimbursement through Intempus in accordance with the criteria from SKAT. You can add supplements to your time registration such as call-out surcharge, shed surcharge and other inconvenience supplements. This function can also be applied to report machine hours used on the specific case and be fully adapted to your company needs and agreement. With Intempus, it becomes easy to find the relevant information when you need it. You can attach photos and documents on all types of registrations, and in that way always have the documentation with you at all times. The attachments are naturally synchronized right away. Intempus’ product registration allows for companies to attach a product register to Intempus. Via Intempus App, workers can report the applied products for each case. You can connect a Bluetooth barcode scanner to Intempus so it is easy to find the products in the register. Intempus Administration contains all cases, clients and employees. Intempus Administration is web-based and is therefore accessible from any computer or tablet. In Intempus Administration, you can have several administrators to approve timesheets from the employees. The work is therefore approved before transferred to your accounting system. In Intempus Administration, you can control which cases your workers have access to and what type of work they can do. Administration allows you to set the frames for your workers easily. In Intempus Administration you can make different reports such as reports regarding time-off balances or sick leave. All the necessary information is collected in the system, allowing you to make reports with just a few clicks. Intempus Administration can integrate to your accounting- and payroll system. Avoid the maintenance of multiple systems and let your data flow automatically between your systems. Intempus has full integration to the accounting system e-conomic allowing your data to flow freely between Intempus and e-conomic. In other words, you can create a case in Intempus that you only a few minutes later can access in e-conomic. Intempus provides full integrations to other accounting systems such as Microsoft Dynamics C5 and NAV. With Intempus’ integrations, making payroll becomes easier than ever. Intempus Administration entails all your employees’ time registrations, which are used as the basis for making payroll. You can easily transfere this information to Intempus’ partners ProLøn, DanLøn or DataLøn. Then payroll can be done with a few clicks. Intempus is designed to work in accordance with collective and local agreements. If employees work after hours, Intempus can automatically add overtime. The employees and administration therefore avoid having to calculate different supplements. All they need to do is to report the start and finish time – and then Intempus will figure the rest in compliance with your agreements. In Intempus you can keep track of the employees time off-balance by setting a daily norm for each employee. If the norm is not achieved, the employee will be notified that the norm has not been reached. Also, it becomes easier to keep track on when employees can take time off due to overtime. 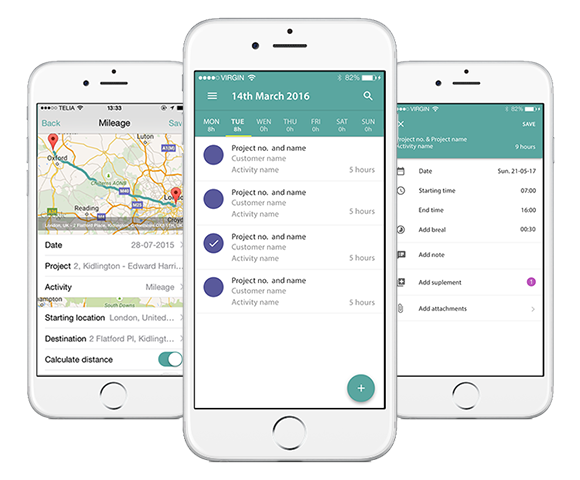 As a result, there is no more need to call different employees to collect delayed timesheets.